Originally published under the title, "Easter Under Islam, Churches Under Attack." As millions of Christians around the world were celebrating Easter Sunday, the Christians of the Muslim world were again under attack. The April 2 Islamic jihad attack on a Kenyan school—where the Islamic murderers made sure to slaughter only Christian students, sparing fellow Muslims—was only the most spectacular attack. 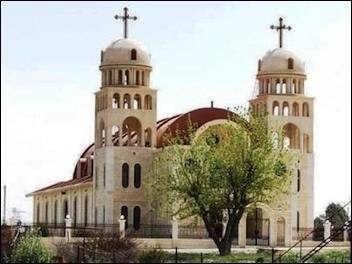 On Easter Sunday itself, as some media reported, the Islamic State destroyed the Virgin Mary Church in Tel Nasri—loosely translated as "Christian Hill"—in northeast Syria. Even lesser known is that other churches and Christiands in the Middle East were attacked during Easter weekend. Take Egypt. President Sisi recently decreed that a Christian church should be built in the Upper Egyptian town of al-Our, where 13 of the 21 Christians who were gruesomely beheaded by the Islamic State in Libya grew up, and where their families still live. The church was meant to honor them and the nation of Egypt. Churches and Christians across the Middle East were attacked during Easter weekend. But, as always happens in Egypt—that is, as always happens in practically every Islamic nation in the world—local Muslims rioted and protested right after Islamic prayers last Friday. 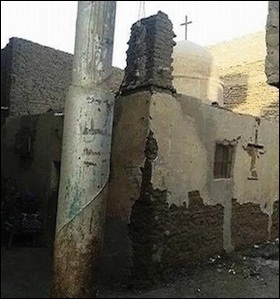 They yelled that they would never allow a church to be built, that "Egypt is Islamic!" and that "Anyway, shape, or form, we will take Sisi down!" By nighttime, Molotov cocktails and stones were thrown at another Coptic church, cars were set ablaze—including one belonging to a relative of one of those decapitated by the Islamic State—and several people were injured. A day later, on Saturday, April 4, Muslims rioted and attacked the Christians of the village of Gala', Samalout district. After waiting for years to repair their dilapidated church (also named after Virgin Mary, see pictures here) Coptic locals finally received all the proper permits to begin restoration. And, as usual, Muslim mayhem broke out. To calm matters, local police invited the Muslim leaders who refused to see the old church building renovated to a meeting with the Christians. The Muslims insisted that the Copts must first accept a number of discriminatory restrictions, including that the building look like a house not a church—certainly no crosses visible anywhere on the building's exterior—and its entrance must be a narrow side door, not at the front of the building which faces the street. Although initial reports said some compromise was formally reached, "Muslim youth" still responded with violence, attacking Coptic homes, businesses, and persons, often by hurling stones. Christian owned wheat farms were destroyed and their potato crops uprooted. Islamic slogans were constantly yelled, including "There is no god but Allah" and "Islamic! Islamic! "—a reflection of the paranoid sentiment that if a single church is built or merely renovated, Egypt will cease to be Islamic. As many Copts have pointed out, they have done everything legally, getting all the necessary permits—and in the instance of the al-Our church, President Sisi himself has approved it—so if Muslim protesters get their way every time, it suggests something else other than Egypt's government is ruling Egypt. The desire of local Christians to renovate this dilapidated church in the Egyptian village of Gala' led to Muslim rioting on April 4. Indeed, not only did local police, according to human rights activists and eye witnesses, fail to respond to the Muslim assailants, some reportedly joined in on the attack on Copts, including by throwing bricks at a vehicle carrying Christian girls. Often we are told that it is a tiny minority of terrorists—the Islamic State, Boko Haram, al-Qaeda, al-Shabaab, ad nauseum—who have "hijacked" Islam for their political goals. But what do we make of these "everyday" Muslims? The mainstream media and White House brushed aside the Islamic State's ritual beheading of 21 Coptic Christians by portraying it as a "criminal" act and not mentioning that the Copts were slaughtered simply for being Christian, as the Islamic State emphatically insisted. Instead, the White House condemned the killing of "Egyptian Citizens." So what about these other angry Muslims in Egypt? They are of the same nationality and culture as the Copts—they are not Libyans, nor are they "ISIS"—they speak the same exact dialect. Some knew the Copts who were beheaded; some still know their mourning families. But to have a church honoring those slaughtered Christians is unacceptable, and prompts more attacks on Christians, including, as seen, on family members of those beheaded in Libya. The reason for this animus is, of course, as simple to understand as it is taboo to mention in "polite society": Islamic law makes unequivocally clear that churches must never be built or even renovated. As relics of a conquered people, churches must go the way of the dodo, one way or another. And that's the point. Violence and intolerance against non-Muslims is not limited to "terrorist" organizations like the Islamic State. It's a product of Islam's core teachings as found in the Koran and Sunna, or example, of Muhammad. Even the aforementioned stipulations for the Samalout church to have no crosses, narrow side door, etc., are a product of Islamic documents, in this case, "The Conditions of Omar." This hostility for and persecution of Christians is of course evident among "terrorist" organizations like the Islamic State, Boko Haram, etc. But it's also evident among Muslim governments, Muslim police, and the Muslim populace. The reason is that it's evident in Islam. We can continue playing games, euphemizing, white washing, invoking "grievances," and so on, but in the end, it is the Koran, it is Muhammad, it is Sharia—in a word, it is Islam. And it is a testimony to the blindness of the West that a thing so self-evident, so obvious, so well-documented—for nearly 1,400 years—is still, nonetheless, so difficult to acknowledge. Raymond Ibrahim is a Shillman Fellow at the David Horowitz Freedom Center and a Judith Friedman Rosen Writing Fellow at the Middle East Forum. He is the author of Crucified Again: Exposing Islam's New War on Christians (2013) and The Al Qaeda Reader (2007).